The Churches Mutual Credit Union was formally launched at Church House today. Church House issued this press release to mark the occasion. The Archbishop of Canterbury’s drive to promote access to responsible credit and savings receives a major boost today with the launch of the Churches Mutual Credit Union Ltd. (CMCU). 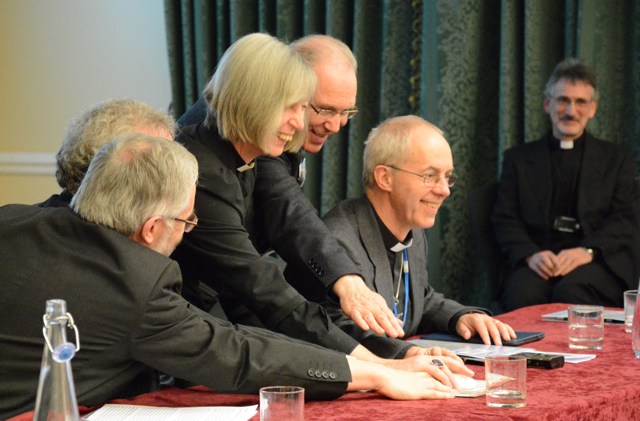 The Most Rev Justin Welby joined the Moderator of the General Assembly of the Church of Scotland, the Rt Rev John Chalmers and the President of the Methodist Conference, The Rev Ken Howcroft, at Church House, central London, to celebrate their respective churches’ collaboration in forming the flagship credit union. The CMCU, which also includes the Scottish Episcopal Church, and the Church in Wales, will offer a range of savings and loan products. Fairness will be at the heart of the CMCU’s values. Initially members will be able to invest in the ‘Founder Member’s Bond’ with ordinary savers accounts and loans becoming available in March. In due course CMCU will offer ISA savings accounts. At least 60,000 individuals, notably ordained ministers, licensed lay ministers, elders, employees and trustees of churches (e.g. Parochial Church Council members) and church charities are eligible to join, along with churches and Anglican and Church of Scotland charities as corporate members. Individuals can join CMCU from tomorrow (Thursday February 12). Archbishop Justin said: “My congratulations go to all involved in establishing the Churches Mutual Credit Union as it is launched today. “Credit unions have the potential to make a transformative contribution to our financial system and I am delighted that it will be possible for clergy, church employees and church trustees to belong to a credit union focused on supporting their particular financial needs. “As the first supporter to sign CMCU’s application to the regulator in 2013 I am looking forward to being one of the first to sign up as a member when registration opens tomorrow. “It is a notable strength of CMCU that it brings together churches from England, Scotland and Wales in this shared venture. Canon Antony MacRow-Wood, CMCU President, and a former President of ABCUL (the Association of British Credit Unions Ltd) said: “After several years of development this is a great day for our churches and a great day for the British credit union sector. “We recognise the strength of the credit union model and wish to offer that to our ministers and employees. Of immediate interest to many, especially ordained ministers, will be our plans to provide a competitive car loan scheme. The CMCU project began in 2008 and is supported by the Church of England, the Church of Scotland, the Scottish Episcopal Church, the Methodist Church and the Church in Wales. The CMCU was given formal authorisation by the regulatory authorities in December, after a rigorous process undertaken by the Financial Conduct Authority and the Prudential Regulation Authority. The Financial Services Compensation Scheme covers deposits up to £85,000. I welcome this development and wish it well. I applied to join as an individual yesterday. But why is membership restricted to clergy, employees and trustees of the sponsoring churches? If the CMCU is to help the most people in need, I would have thought it would want to attract funds from as many supporters as possible. As I understand it members of a credit union need to share a “common bond” so CMCU cannot be opened to everyone. However we were told at the launch that the aim is to eventually open membership to all active church members. There is now a website, although it does not yet carry very much information. Is this collective button-pushing the banking equivalent of the laying-on of hands? And, if so, was the Archbishop of York exercising ‘gracious restraint’ by his absence?! You make very good points, Kelvin, and I may have been overhasty in my enthusiasm for this venture, rather than credit unions in general. Still, to judge by the glacial speed with which my application for membership is proceeding, it may not come to anything anyway. I think they must have used government web experts to design their system!